Contact should be suspended in 30 Texas counties until further notice. 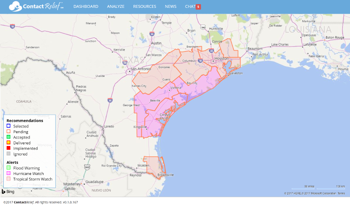 Harvey becomes a tropical storm as hurricane warnings are issued for the Texas coastline. 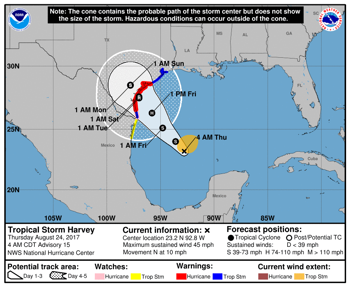 Harvey strengthens into a Tropical Depression as Hurricane Watches and other advisories are issued for the Texas Coast. 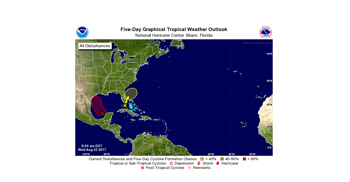 The storm is expected to reform into a tropical cyclone over the next 48 hours and bring heavy rainfall to the Texas Gulf Coast. Why don't hurricanes hit the West Coast of the USA? ContactRelief Meteorologist Dr. Kevin Levey explains why the science behind the hurricane tracks. ContactRelief Meteorologist Dr. Kevin Levey assesses the 2017 hurricane forecast. 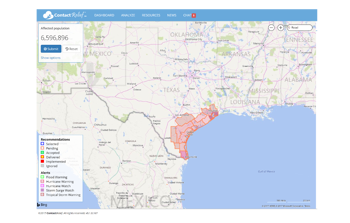 San Fransico based premier provider of high-resolution weather data and alert services, announced that it has been selected by ContactRelief, LLC to provide meteorological services for ContactRelief's Disaster Decision Engine. IF I KNEW THEN..." series ask executives, entrepreneurs and business leaders about mistakes that have shaped their business philosophy. ContactRelief Meteorologist Dr. Kevin Levey explains 5 important hurricane facts risk managers and call center professionals need to know.